The Ninth Grade Service Learning Incubator asks students to find out issues they are interested in and explore a solution students can help improve. Yesterday, students presented their findings. Some groups will continue with their proposed project next year, while others will join an already existing service group. 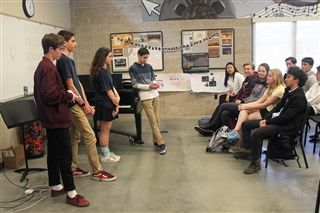 Ninth graders were interested in a variety of topics, such as body image positivity, animal shelter overcrowding, food insecurity in San Diego County and more. Upperclassmen offered guidance to the fledgling groups, asking the presenters questions about plans and offering advice from their own experience. Read more about the incubator here.